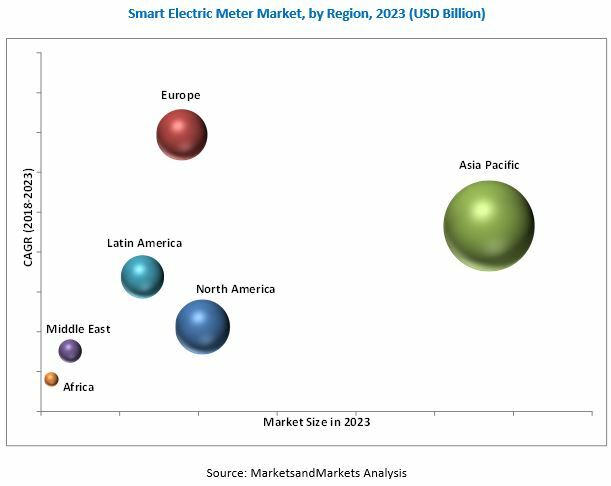 [198 Pages Report] The global smart electric meter market was valued USD 9.06 Billion in 2017; it is projected to reach USD 11.33 Billion by 2023, growing at a CAGR of 4.11%, during the forecast period. Increased need for efficient data monitoring systems coupled with favorable government policies for smart meter rollout, improved cost savings owing to the use of smart meters, increased investment in smart grid projects in key geographical regions such as Europe and North America, are likely to drive the smart electric meter market. The base year used for company profiles was 2017. Where information was unavailable for the base year, the prior year has been considered. This research study involved the use of extensive secondary sources, directories, and databases, such as Hoovers, Bloomberg Businessweek, Factiva, and OneSource, to identify and collect information useful for a technical, market-oriented, and commercial study of the smart electric meter market. Primary sources are mainly industry experts from the core and related industries, preferred suppliers, manufacturers, distributors, service providers, technology developers, standards and certification organizations of companies, and organizations related to all the segments of this industry’s value chain. The points below explain the research methodology. After arriving at the overall market size, the total market has been split into several segments and subsegments. The figure given below illustrates the breakdown of primaries conducted during the research study, on the basis of company type, designation, and region. Key players in the smart electric meter market are Itron (US), Landis+Gyr (Toshiba Corporation) (Switzerland), Jiangsu Linyang (China), Wasion (China), Aclara Technologies (Hubbell Incorporated) (US), Schneider (France), Siemens (Germany), Honeywell (US), and Iskraemeco (Slovenia). Country-wise analysis can be extended by one country for every region. 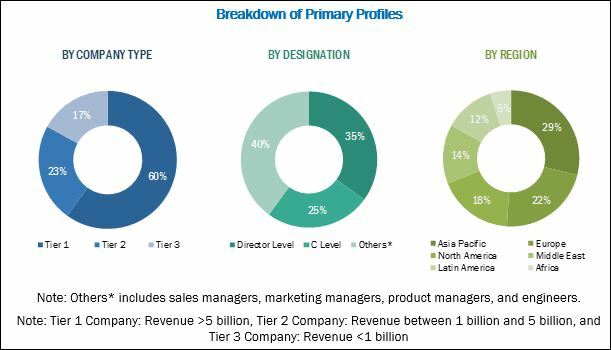 The smart electric meter market is projected to grow from an estimated USD 9.27 Billion in 2018 to USD 11.33 Billion by 2023, at a CAGR of 4.11%, from 2018 to 2023. The increased need for efficient data monitoring systems, coupled with favourable government policies for a smart meter rollout is driving the market for smart electric meters. Other factors include improved cost savings, increased investment in smart grid projects in Europe and North America, and increased emphasis on renewable energy sources. The report segments the smart electric meter market, on the basis of end-user, into residential, commercial, and industrial. The residential segment led the smart electric meter market by end-user from 2018 to 2023, owing to the widespread use of sophisticated electrical, electronic, and data equipment. The commercial segment is expected to be the fastest-growing segment of the smart electric meter market, by end-user, during the forecast period. The global smart electric meter market, by communication technology type, has been segmented into PLC, RF, and cellular-based meters. The PLC segment is the fastest-growing market during the forecast period and is also projected to dominate the market during the same period. PLC is the most commonly used communication technology due to its advantages such as the use of the existing utility infrastructure of poles & wires, improved cost-effectiveness for rural lines, and usability in a challenging terrain. The report further segments the smart electric meter market, by phase, into single-phase and three-phase configurations. The three-phase segment is the fastest-growing market during the forecast period and is also projected to dominate the market during the same period. Three-phase meters are mostly used in industrial applications and in large commercial applications. Single-phase smart electric meters are mostly used in residential applications and across various industries such as the chemical plants, food & beverage, cement, steel manufacturing, automotive. In this report, the smart electric meter market has been analyzed with respect to six regions, namely, Asia Pacific, North America, Europe, the Middle East, Latin America, and Africa. Asia Pacific is expected to dominate the smart electric meter market during the forecast period because of the rise in investments in smart grid technologies and smart cities, the increase in the number of data centers, and a surge in IT hubs and commercial institutions. Europe is expected to grow at the fastest rate during the forecast period because of government initiatives such as the European Union’s (EU) 20:20:20 plan, which aims at reducing greenhouse gas emissions. The figure below shows the projected market sizes of various regions with respective CAGRs for 2023. The major factor restraining the growth of the smart electric meter market are the delay in smart meter rollout projects, and high initial investment acting as a restraint for growth in developing economies. Some of the leading players in the smart electric meter market include Itron (US), Landis+Gyr (Toshiba Corporation) (Switzerland), Jiangsu Linyang (China), Wasion (China), Aclara Technologies (Hubbell Incorporated) (US), Schneider (France), Siemens (Germany), Honeywell (US), and Iskraemeco (Slovenia). These players have adopted growth strategies such as new product launches, contracts & agreements, partnerships, collaborations, alliances, and joint ventures, mergers & acquisitions, and investments & expansions to capture a larger share of the smart electric meter market.